Not to be outdone by our Better-Than-Black-Friday Specials last year, we've teamed up with Velocity Systems/Mayflower to bring you another KILLER deal! TODAY ONLY: Enjoy 20% OFF of a Velocity BOSS Rugby Short Sleeve Shirt! There's a reason why most of the buyers of this shirt are REPEAT customers. If you've never owned one of these, this is your chance to try one at a discount that isn't offered any other time of the year! 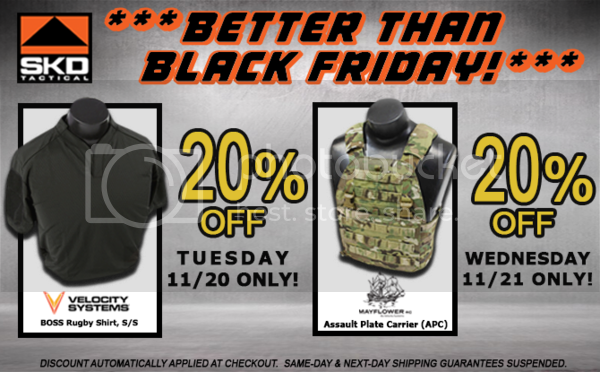 TOMORROW ONLY: Take 20% OFF of the Velocity APC Plate Carrier! Consistently one of our top sellers throughout the year! Normally $224, our special sale brings the price down to $179.20!